Mason's Hygrometer. 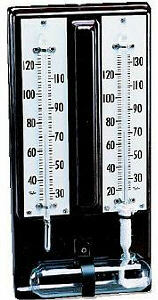 Temperature range 60°F to 120°F. Relative Humidity Table included. Mercury filled tubes. Metal backing. Laminated wood impregnated case, mahogany finish. Range 60 to 120 Fahrenheit. Boxed, with spare wick and relative humidity tables.